The quality really shows in the beautiful Maxey built home on southern edge of Tipton. Attractive home with brick front showcasing the awesome front porch with room for seating, 2 gable windows in high roof pitch gives this home that executive feel this area offers. Oak floored impressive foyer upon entering with coat closet. 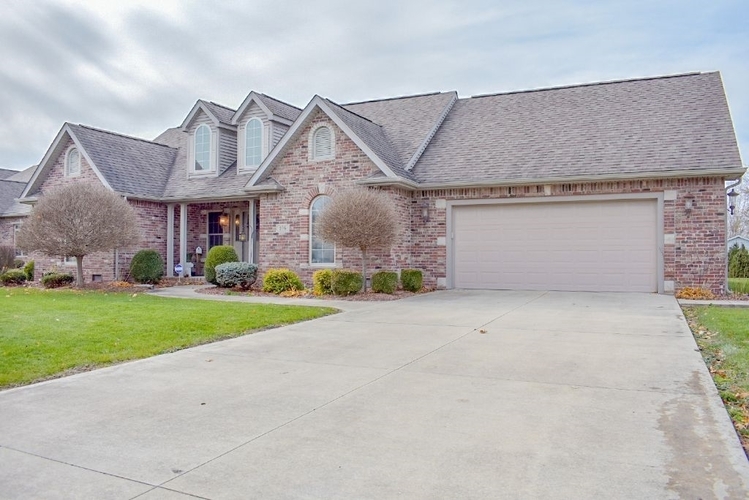 Home offers beautiful oak custom trim thru out with dental crown molding and 4 stately solid oak columns upon entering large Great Room with tray ceiling, gas fireplace with brick hearth. Awesome eat in kitchen with center island with bar and oak cabinets with crown molding and everyday eating area. Dining room is off kitchen with carpet surrounded by hardwood flooring. Split bedroom plan with 2 bedrooms and full bath on left side of house and 16x16 master bedroom with huge master bath offering whirlpool tub, separate shower, twin vanity and double doors. Large utility room. Home is on crawl space and has floored attic access, 2 car attached garage with long concrete drive, and garage service door. Garage also has separate mechanical room for furnace, brand new water heater, and water softener along with additional storage. Tipton Schools. Large almost 1/2 acre lot in quiet neighborhood. Directions:From Kokomo take US31 to SR28 to Tipton and at curve going into town of Tipton continue to go straight to 200 West....turn right on 200 West to entrance to Southfield Estates, turn left at T and home will be on your left.